In the early days of her career as a corporate communicator, she joined IABC to develop as a professional and build a network of peers, some of which she accomplished by attending networking events and World Conferences. As her children grew and she launched her business, Get It Write, she began volunteering. 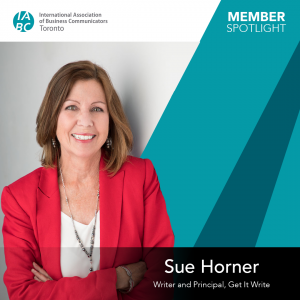 She is one of the founders of IABC/Toronto’s Westend Communicators group and spent more than a decade helping build connections between members living or working west of Toronto. She was on the executive of what is now IABC/Toronto’s Professional Independent Communicators (PIC) from 2004 to 2006, and again since 2013, supporting efforts to improve communication between members running their own businesses. “Besides doing a good deed and contributing to the association, volunteering has helped me make new friends, grow my network, gain more visibility and demonstrate my skills and reliability,” Horner says.